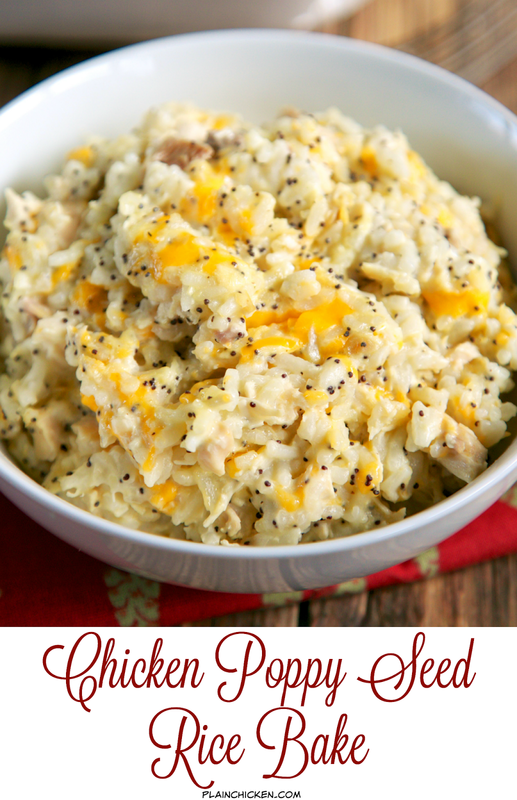 Chicken Poppy Seed Rice Bake - chicken, cheddar, sour cream, chicken soup, poppy seeds and rice - quick and easy weeknight casserole! Use rotisserie chicken and this comes together in 5 minutes! SO good! On the table in under 30 minutes! We make this at least once a week!! I am in love with all of these Chicken and Rice Bakes that I've been making the past few months. They are super quick and easy to make. They also taste great! 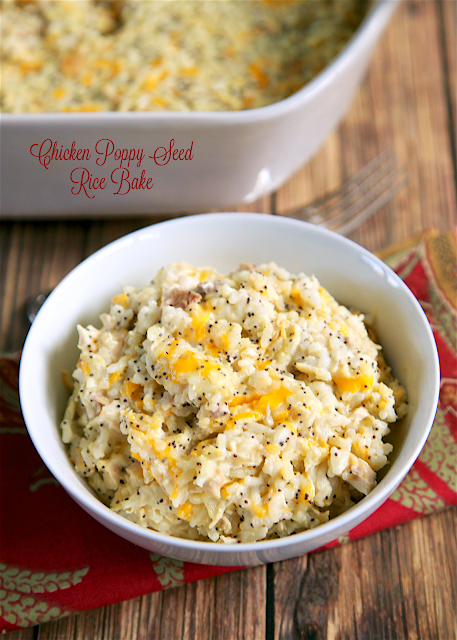 This Chicken Poppy Seed Rice Bake is no exception. It was quick, easy and delicious! Serve with some green beans and crusty bread for a complete meal that is ready in about 30 minutes! I like to use rotisserie chicken in this casserole. I always have some in my freezer. You could also use some leftover turkey from the holidays. The casserole only takes about 5 minutes to mix together and it is ready for the oven. You can definitely make this ahead of time and refrigerate or freeze it for later. 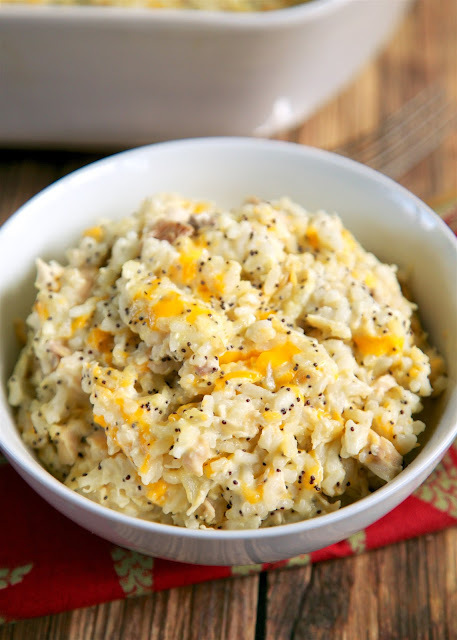 In a large bowl, combine chicken, chicken soup, sour cream, cheddar cheese, poppy seeds, chicken broth and cooked rice. Spread into prepared pan. I'm making this tonight! What do you think about adding broccoli? I think that would be awesome! Enjoy! This is so good! I made it after my extended family showed up unexpectedly and stayed for dinner. I adjusted the ingredients slightly because we have vegetarians in our family and I wanted to feed them the same meal. I used jasmine rice because it was already made and in my fridge, added a bag of thawed, chopped broccoli, used sharp cheddar because I had it, and cream of mushroom soup. The poppy seeds are a wonderful addition! I served this as the main dish for the vegetarians with a side salad and served a rotisserie chicken from the grocery store separately for the carnivores. We had no leftovers and everyone was happy with dinner. Really love how versatile this recipe can be! This is a favorite in my family. 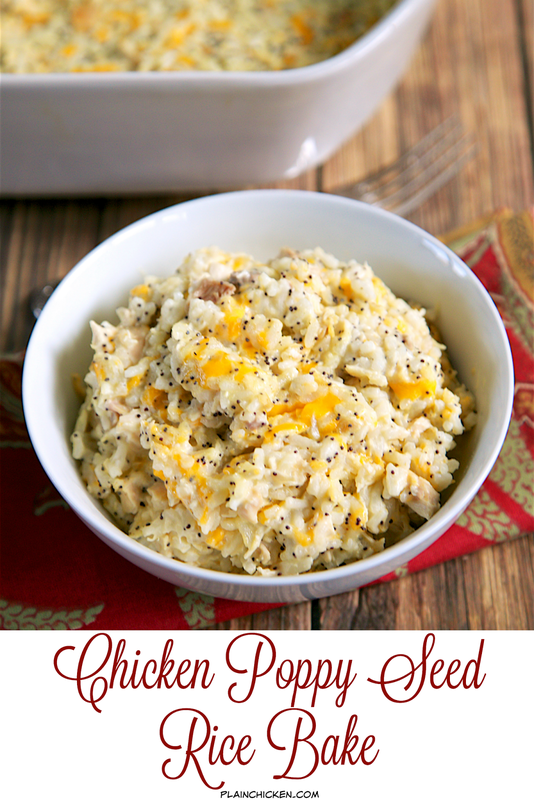 In the past I've made the rice separate and served the poppy seed chicken over the top of it. Adding the rice in saves a step. One thing that really makes this even better is crushing some Ritz crackers as a topping and drizzling with butter before baking. Delicious addition you should try! I made it tonight for dinner. Added ritz crackers crumbled on top and used brown basmati rice instead of white rice. Delicious!